Mesopotamians are probably best known for invention of writing but their achievements in science and technology correspond to the level of socioeconomic development and are comparable with achievements of modern society. Harsh weather and environmental conditions required artificial irrigation, while construction of irrigation systems and building activities greatly influenced the development of mathematics. On the other hand annual inundations and agricultural activities resulted in the development of calendar which based on observation and study of the stars, moon and the sky. Irrigation systems were essential for Mesopotamian agriculture and required collaboration of a wider community, good organization and a single plan which eventually led to the formation of centralized government. On the other hand, construction of irrigation systems and later of temples, palaces and other buildings required precise measurements which resulted in the development of mathematics. The Mesopotamians used the sexagesimal numeral system (base 60) and all four mathematical operations (addition, subtraction, multiplication and exponentiation), while the clay tablets from the Library of Ashurbanipal include quadratic and cubic equations, and fractions. Knowledge in geometry probably encompassed general rules for measuring areas and volumes. Mesopotamians also used π which was estimated as 3. The sexagesimal numeral system was also used for temporal measurement: year was divided into 12 months, month into 30 days, day into 2x12 hours, hour into 60 minutes and minute into 60 seconds. The Mesopotamians also divided a circle into 360 degrees of 60 arc minutes. The priests observed and recorded the celestial phenomena from the temples which also served as observatories. The priests composed various celestial maps and devices for calculating paths of celestial bodies, while the Babylonians knew to calculate the movements of the sun, moon and planets (they knew 5 planets - Jupiter, Venus, saturn, Mercury and Mars), and to predict solar and lunar eclipses. The Babylonians used lunar calendar which divided a year into 12 lunar months (29,5 days) and 11 days, while the new year started in spring. The archeological finds also revealed that the Babylonian priests developed the zodiac of twelve signs and the first horoscopes which led to development of astrology. 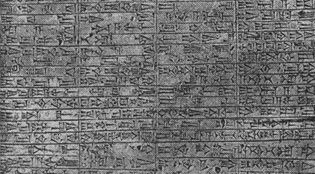 The oldest texts mentioning medicine in Mesopotamia date from the Old Babylonian Period, more precisely from the 18th century BC stone pillar on which is inscribed the famous Code of Hammurabi. The Code of Hammurabi reveals that besides healers the Babylonians also had physicians who were performing “operations” with operating knifes as well as that they were facing severe punishment if their patients died. Later were introduced the concepts of diagnosis, prognosis, physical examination and prescriptions, while the texts on medicine also included detailed descriptions of signs and symptoms of various diseases and illnesses. One of the most famous Mesopotamian therapeutic texts is the diagnostic handbook from the 11th century BC which was written by Borsippan physician Esagil-kin-aply. The Library of Ashurbanipal also included a herbal handbook with descriptions of herbs and their use for therapeutic purposes. However, divination and exorcism remained very popular methods for curing series of diseases and illnesses.